While the gifts under the tree may have all been unwrapped, we have one (but actually several) last gift for you! Hey! Welcome back to the Sylvan Brandt Blog! We haven’t posted in over a month and I do apologize for that…time flies when you’re having fun! We hope that you had a peaceful time of rest and reflection with your family this past weekend as we celebrated the birth of Jesus. While we’d all love to sit in that moment of rest and reflection a bit longer, the reality is that we have to get back to work. 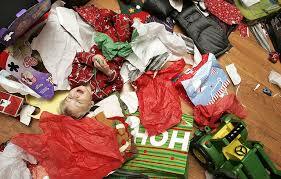 While the gifts under the tree may have all been unwrapped, we have one (but actually several) last gift for you! With multiple items in our inventory, we’ve decided to have a MASSIVE sale on all of our stock to make way for more great items coming in 2018. So let’s hop to it! This pack was freshly made and is a BEAUT! We’ve never offered Chestnut this cheap and probably never will again. Regularly $13sq ft, Sale Price is $10! 350sq ft of Narrow Poplar Attic is normally $9sq ft, but the Sale Price is a mere $5sq ft! Planed White Pine Barn Siding would make for a great floor, ceiling, or accent wall! 200sq ft regularly priced at $11sq ft is now just $6sq ft! 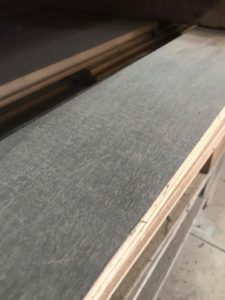 200sq ft of Wide Resawn Oak Valued at $12sq ft, Sale Price $10sq ft! 100sq ft of Narrow Resawn Chestnut Valued at $12sq ft, Sale Price $8sq ft! 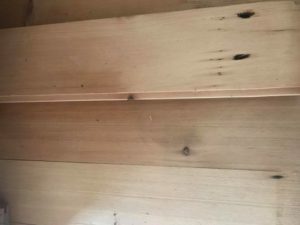 125sq ft of 4″-10″ Resawn White Pine Valued at $9sq ft, Sale Price $4sq ft! 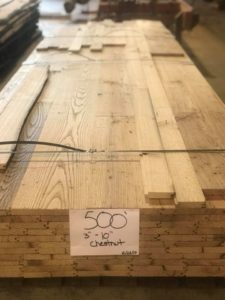 We also have some of our regularly discounted Shorts in stock: 375sq ft of Resawn Oak @ $5sq ft and 168sq ft of Resawn Heart Pine @ $6sq ft! We also have some tables in our Showroom that we’re offering at CRAZY prices! 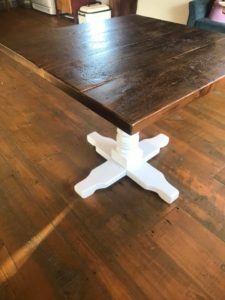 24″ X 70″ Planed White Pine table with painted base // Valued at $1,150, Sale Price $600!!!!!!! 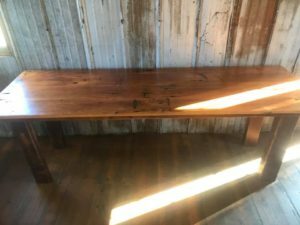 30″ x 84″ White Pine Barn Siding table // Valued at $1,200 SALE PRICE $600!!! 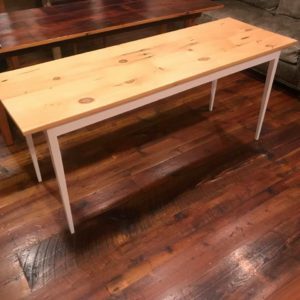 29″ x 89″ x 30″ White Pine barn siding table // Valued at $900 SALE PRICE $450!!!! 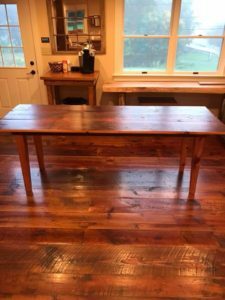 3’x3′ White Pine Barn Floor Plank table with painted base // Valued at $475 SALE PRICE $225!!! Feel free to contact us with any questions by phone (717)626-4520, email info@sylvanbrandt.com, or visit us in person at 756 Rothsville Road, Lititz, PA 17543. We look forward to talking with you! And as always, don’t forget to connect and follow along with us on Instagram and Facebook! Posted in Uncategorized on December 28, 2017 by Kaddie Hollinger.